Visual Skills & Business Development For Process Professionals Who Work With Groups and/or Individuals. Two powerful ways (online and in-person) for visual keeners like you to further develop your graphic chops and enhance your visual practice. For all manner of Process Professionals who work visually with groups and/or individuals (leaders, managers, consultants, facilitators, trainers,speakers, mediators, coaches, therapists, counselors, graphic recorders, scribes, etc). Boost your visual skills, refine your identity & brand, laser your marketing (whether internal in an organization or an external free agent) and get knowledgeable, supportive guidance on any outer and inner assistance you need. 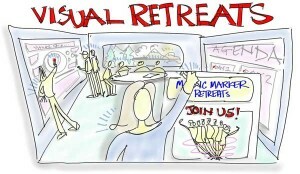 Mastermind with other dedicated Visual Practitioners, your Graphic Tribe! Below is a thorough info page on the Magic Marker programs. 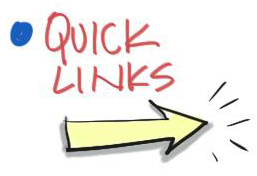 For those who want to skip ahead, here are a list of hyperlinks so you can get to your info fast! I’ve been teaching Visual Skills since the 90s. Both in the United States (I spent a decade in San Francisco, the mecca for Graphic Facilitation) and in my home country of Canada (I returned to beautiful Victoria, British Columbia in 2002). In the early days, I was one of a handful of teachers in the world who taught these skills, and people travelled great distances to get my mentorship (still do). With the advent of online eLearning, students can now access my niche wisdom from the comfort of their own offices and homes. In the early years, I focused my efforts on teaching the foundational skills – I still run beginner level courses. However, as my volume of students grew, and the field overall blossomed, the need for advanced training and community organically occurred. I’ve offered all sorts of advanced options over the years. This year I’m offering both Online Masterminds and an In-person Retreats. You can do them in combination or separately, depending on whether you prefer online or in-person support, or both. Magic Marker Programs are for Process Professionals who have already taken beginner level Visual Skills instruction (either through my Fundamentals of Working Visually course or through equivalent instruction elsewhere) … and are in the midst of integrating these skills to higher levels of proficiency and reward. These Programs are for Process Professionals across the spectrum of group and individual work, whether you are internal in an organization or independently employed: leaders, managers, consultants, facilitators, trainers, mediators, coaches, therapists, scribes/recorders, and content experts who want to develop your own visual tools, etc. Developing the visual and business skills necessary for a successful practice can be challenging to do in isolation. It takes chutzpah to stand at a wall (or scribe on a tablet) for all to see. And to work through your art, visibility, comparison-itis, money and technology issues. These are ever-evolving and developing skills. It really helps to have a seasoned mentor and group of keen peers to help you through the inevitable bumps. That is what my Magic Marker experiences are about – providing a smart and supportive environment for your continued evolution. Embody Your Authentic Self More Strongly In The World. Live Life To Its Fullest. Become Your Best Self! The Magic Marker Mastermind helped me put the pieces of the puzzle together and clarify the new path for my business. I took Christina’s online SHIFT-IT course, which solidified that I wanted to work in a visual way, and introduced me to the concept of “inner work.” Next, I took her Fundamentals of Working Visually and began to use all the new tools in my brand strategy practice. I was enjoying this work, but was feeling that there was another big leap forward for me. 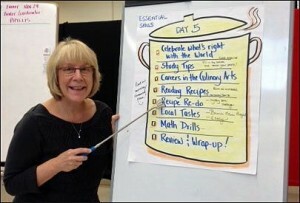 Christina’s high-quality courses teach much more than how to develop a visual toolkit. She is very knowledgeable in Organizational Development, strategic visioning and planning processes all of which are key components of my practice. She has also successfully made the transition from the corporate world to running her own thriving business so she understands the journey and is very helpful to students who are on the same path. Thanks, Christina and fellow MMMers! “Fast, fast, fast … that is the nature of my entry into shepherding an internal visual practice in our busy consulting firm. 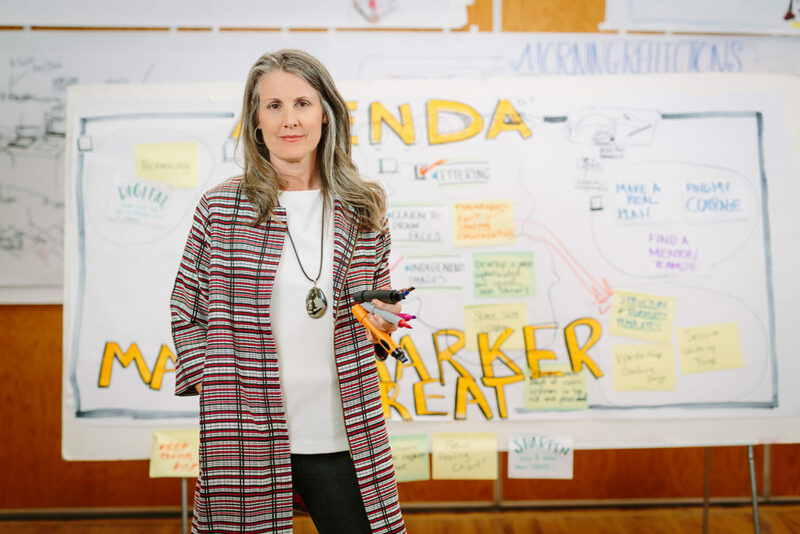 After taking Christina’s Fundamentals of Working Visually, I was launched full speed into a fascinating opportunity to bring the visual way of working to our agency. I jumped at the chance to claim one of the Magic Marker Mastermind seats so I had ready access to a skilled Interactive-Visuals mentor and colleagues who could support and assist me as I dove headlong into this intriguing challenge. In a few whirlwind months our internal visual practice has received C-suite championing to create and implement a full suite of visual applications that suit our broad range of consulting environments. Education is key, both internally and with our external clients … about how working visually supports our engagements and allows us to operate at a sophisticated level of collaboration and transparency … literally getting us all onto the same page and moving effectively together. Key for the fast pace and high stakes of our projects. 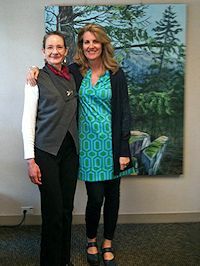 “I’ve worked with Christina for several years now, using her as my personal coach and then as my trainer for the Fundamentals of Working Visually. Working in a visual way has been a dream of mine for a while, and finding Christina’ and her support showed me that it is possible to learn these skills despite no artistic talent at all! Each Magic Marker Program (whether the Online Mastermind or the In-Person Retreat) is a unique experience onto itself. We co-build each program according to the needs of participants who come at that particular time. It’s not unusual for people to come to several Magic Marker experiences over time, as who you are and what you NOW need help on, morphs over time. One of my favorite questions as a coach is “who are you today?!”. The Magic Marker Online Mastermind is conducted via live web conference technology. Each week we connect from the comfort of our own office or home. To participate, you need a computer with decent internet speed with an embedded videocam (most modern computers have this function). Phone apps and dial-in phone number is also an option for when you are on the go. All sessions are video and mp3 recorded for easy replay (should you miss a webinar or want to re-listen). How the Technology Works – its simple! At the appointed time, you join us online via your computer to interact live . We also have a private online forum, which allows us to communicate between sessions (post and comment on assignments, share resources, etc). An awesome way for you to share your work, receive feedback and connect with me and your mastermind colleagues! The in-person version of this workshop is held in beautiful Victoria, British Columbia, Canada. Victoria is a great little city with world class amenities. Upon registration you receive the logistics for our meeting location, plus hotel suggestions. Victoria is a full-service tourism destination with many options and additional activities. My assistant is available to answer your travel and accommodation questions. See Info on Travel to Victoria, B.C. Unsupportive Colleagues, Supervisors or Family Members (how to deal with). Visioning and Action Planning (what’s next and your plan to manifest it). With a Masters Degree in Organizational Development & Transformation (ODT), I began my consulting career in the San Francisco Bay area in the mid-90s, traveling extensively throughout North America and Europe (first as an employee of The Grove Consultants International (pioneering Group Graphics firm led by David Sibbet) … then via my own independent practice, Make Your Mark, LLC). I honed my skills in organizational development, change management, strategic planning and visioning, scenarios, team performance and conflict resolution (all using visual methods) working for such notable clients as Hewlett-Packard, eBay, Stanford University, British Broadcast Corp (BBC), The Institute for the Future, The Gordon and Betty Moore Foundation, American Institute of CPAs, etc. I experienced a quickening of my creative and spiritual path in the aftermath of the Sept. 11th tragedy (scheduled to be in New York that fated day but having a series of synchronistic events keep me away). Via that wake-up call I transitioned my work to include integration of the visual methodology with coaching and spirituality – returning to my lovely hometown of Victoria, British Columbia, Canada in 2003 and creating SHIFT-IT Coach, Inc.
As a pioneering ‘Visual Coach’, I facilitate powerful awakening in individuals, partners and conscious businesses and am an internationally known coach of coaches. Inspirationally received, my SHIFT-IT System® (comprised of 17 visual coaching tools) helps individuals, couples and families discover and align with what they really want in work and life. Through private coaching, mastermind groups and my popular Certified Visual Coach® and Working Visually programs I guide Process Professionals from around the world on how to effectively use visual thinking methods with their own clientele. A proponent of Law of Attraction and deep emotional and energetic work, my soul’s purpose is to assist a shift in consciousness on our planet via the individuals, groups and companies I help empower. Process Professionals change our world, so I fulfill my purpose by training and coaching the Process Professionals. Having been through the process of forging a prosperous alternative path, I compassionately champion you in making your own SHIFT to a successful process lifestyle … by using Interactive-Visuals and other innovative methods in their most effective manner. For those who need to first acquire The Fundamentals of Working Visually pre-requisite, please be aware that there is an annual opportunity to do both the beginner and advanced courses in an in-person intensive setting. Great for travelers who want to make the most of one travel trip and for locals who want to get up to speed as quickly as possible. My courses aren’t cheap, they are serious professional development which reap a large return on investment for those who apply what I teach (Working Visually is a valuable skill). I do offer a price break for those who wish to do these two in-person courses consecutively back-to-back in one go. Enter the code below into the coupon code field of our secure online shopping cart at time of purchase to save $500. FYI, you are of course welcome to break these courses into two trips (i.e. do Fundamentals first and return at a later year for the Magic Marker Retreat), however you are not eligible for use of the coupon. When you take valuable skills training,consider what it’s WORTH to you. The going day rate for Visual Practitioners is $800 on the low end and $2000+ on the mid-range. Some high end consultants using visual methods charge upwards of $5000+. My day rate is $3000. To put your investment into perspective, I am mentoring you in our lucrative craft for what it costs for a client to hire me for a few hours.These Magic Marker Programs are a very good value for rare specialized support. The Return on Investment (ROI) in your Magic Marker experiences should be recouped quickly using your new visual and business skills. Frankly, a job or two will do it depending on your rate. Plus these experiences are tax deductible expenses for you (or your employer if they are paying for them). 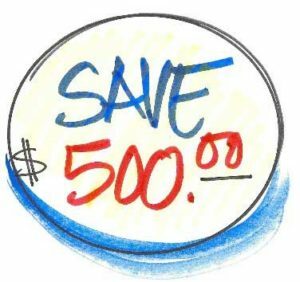 Note: If you wish to attend the in-person consecutive offerings of Fundamentals of Working Visually and Magic Marker Retreat, please be sure to enter the coupon code (MAGIC COMBO) at time of purchase to receive your $500 savings. Oct. 8 – Dec. 19, 2018, (Mondays, 10-11:30am Pacific). 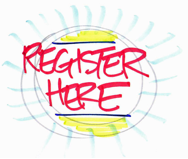 15, 90-Minute Live Webinars, Full Recordings. 18 Bonus Videos. Forum. 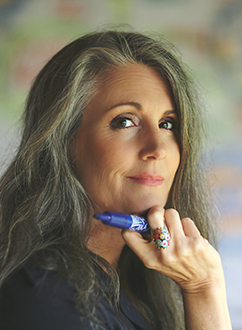 Oct. 8 – Dec. 19, 2018, Basic Package Plus 3, 45-Minute Coaching Sessions with Christina Merkley (via private web conference). These coaching calls are specialty priced (save $300 off regular 3-Pack Rate). Includes the 3 Day Retreat (June 3 – 5, 2019 in Victoria, British Columbia, Canada). 9am-5pm Schedule. 18 Bonus Videos. Snacks. Basic Package Plus 3, Private 45-Minute Coaching Sessions with Christina Merkley (via web conferencing. These coaching calls are specialty priced (save $300 off regular 3-Pack Rate). * Prerequisite is Fundamentals of Working Visually or equivalent experience. * Payment plans are legal contracts to be fulfilled per terms stated. The 1 pay is the most affordable option, as payment plans include additional fees. First payment immediate, then pulled every 30 days until complete. I wish you well on your visual path, from one doodler and marker junkie to another. And salute you for ‘going for it’. Our world (and this fascinating field) needs as many aligned and skilled Process Professionals as it can get! P.S. As discussed, the prerequisite for this program is my Fundamentals of Working Visually … or equivalent experience. Wondering if you have that equivalent experience? Email my assistant at admin@shift-it-coach.com and she’ll book an Exploratory Chat between us where you and I can discuss your background and fit. P.P.S. Have you attended Magic Marker experiences previously? Come back for another round of development and community, as each retreat is unique (just like you are each time you attend). Zero in on the priorities most important to you now and get a booster shoot for your career and spirit! P.P.P. S. The dates of these Magic Marker programs don’t work for you? Check out private training and apprenticeships (in-person) and distance sessions for mentoring (via web conferencing and tablet). “Are you a visual person? Do you like to work with images that evoke thoughts, emotions and concepts? Do you enjoy using colour, simple lines and succinct vocabulary to tell a story? Do you enjoy discovering with like-minded individuals? Do you like being mentored by an exciting individual who has a keen ability to “get you” quickly and coach you to develop a clear action plan with meaningful, concrete activity to move you closer to your goals? I recommend MMM to anyone inclined to explore a fun and direct craft for getting messages across for work, personal life or continuous learning. Be ready to work large, Large, LARGE! The experience is very liberating in an extremely safe environment. I am in no way an artist but I love learning about capturing ideas and perspective quickly in a visual manner. 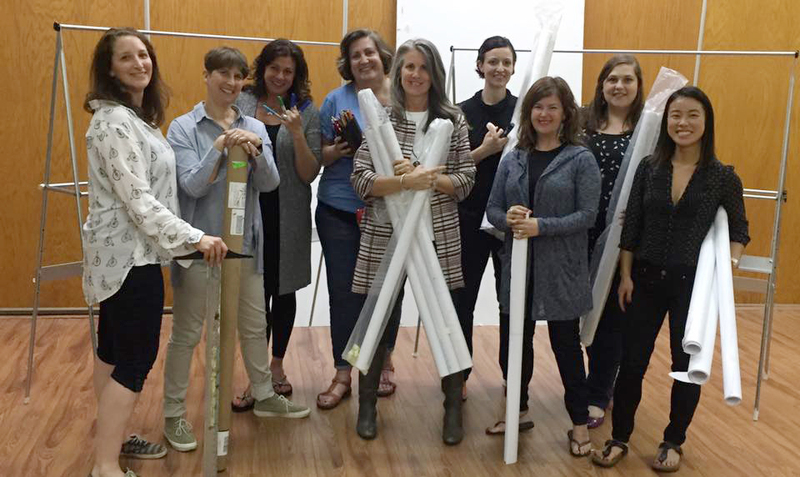 I had the pleasure of learning with individuals who I would consider to be artists and excellent conceptual planners but felt that my participation was just as valuable. The experience for me was one of honouring my capacity to learn the craft at my own pace. Sure there were people that were better and more driven to produce. I never once felt that I had to keep up, rather, was coached to be where I was at and this made the experience very rich and enjoyable. HIGHLY RECOMMEND HER COURSES AND CAN VIRTUALLY GUARANTEE YOU WON’T BE ABLE TO STOP AT JUST ONE! “I was first exposed to working visually in 2010 when I began to cast about for more interesting ways to engage leaders in the wide variety of offsites that I lead. After reading a number of books and applying general concepts, I knew that I would benefit from some more structured “hands on” learning. Enter Christina Merkley. I started with her beginning course and was hooked! Fundamentals of Working Visually was an incredibly rich learning experience. Christina’s intellectual generosity is unparalleled. She not only skillfully taught the basics but also shared tips and tricks to accelerate my learning. Critical for me as I am not a natural artist! There had been icons that I had consistently struggled with and one particular session broke my logjam. My facilitation clients have proactively commented on the power of my visuals to focus and enable their conversations that matter. Magic Marker Mastermind was my next opportunity to further stretch. While the calls were a great way to get feedback and to share insights, I found the real-time, ‘at the wall’ retreats invaluable for application and experimentation. A fertile environment for breakthroughs of which I had many! Emboldened by success with facilitation clients, I decided to pursue using visuals with my coaching clients. While I often found myself drawing in sessions, Christina’s approach is more deliberate and intentional. I enrolled in Visual Coach Certification (which I’ll finish next month). The three coachees that I have taken through The SHIFT-IT Visual Coaching Process® were extremely positive about this inner work/outer work framework and the power of the visuals to spur deeper thinking. In the past year I’ve been in two of Christina’s courses: Fundamentals of Working Visually and the Magic Marker Mastermind. I’m about to launch into her Biz Essentials for Process Professionals and expect that I’ll continue to study with Christina in the years to come because it’s been an invaluable investment of my time and money. As a solo practitioner, I was looking for a thought partner to help me take my consultancy to the next level. Three partnerships later, enter Christina. She offered just what I needed through her visual skills training, advanced mastermind and private coaching. Christina’s first class got me started. 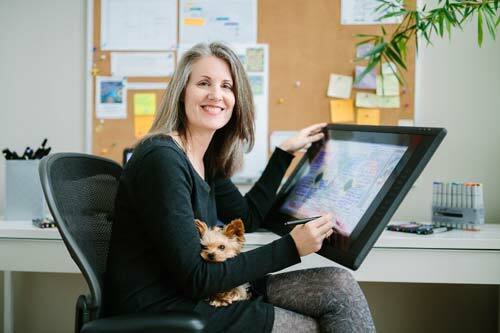 Her focus on process and exposure to the four ways of working visually helped me learn what I wanted to know and, most importantly, to distinguish myself in the marketplace. 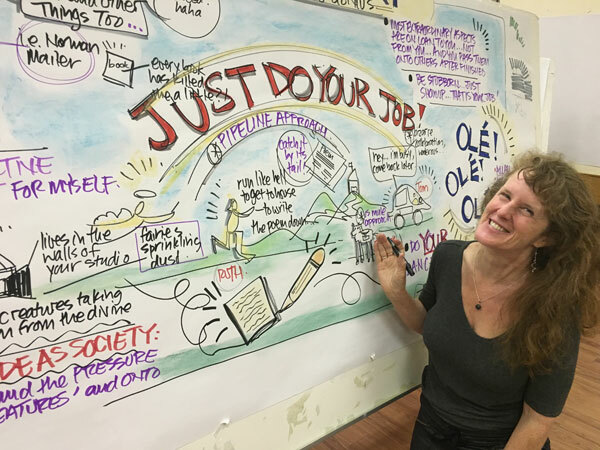 I integrate visuals in my facilitation work and provide sketchnoting for live events. In Magic Marker Mastermind I further refined my style and honed in on the business questions I needed to explore. I see how Christina builds her business as she models the behaviors she teaches and shares valuable insider tips on how to work with visuals more effectively. Christina has such useful breadth and depth. She’s comfortable in the roles of teacher, coach, mentor, and peer. Through her I’ve learned what it means to live with an abundant mindset as she’s graciously shares insights, processes and network. If you’re looking to take your business to the next level I highly suggest her curriculum. Christina helps you find your edge in the business world and take your enterprise where you dream it to go. Christina has been my Coach and Mentor for several years and I have attended pretty much every program she has ever run. 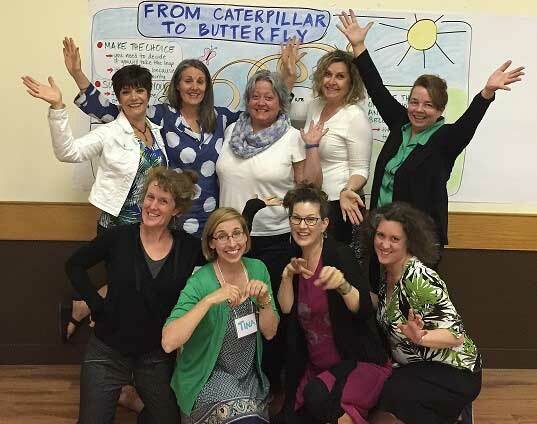 This is the second Mastermind group I have been a member of and as with all Christina’s programs and trainings it delivered huge value on multiple levels. As a developing Visual Practitioner MMM gave me a hotbed incubator environment to support developing and growing my visual skills, expand into new learning territories such as digital scribing and also benefit hugely from the rich mix of experience and knowledge of the other mastermind participants. As always Christina attracts high calibre, quality students from around the globe and this group was no exception. Weekly group calls meant maintained and consistent coaching and support plus the ever important element of an in-person retreat gave all of us a super strong springboard from which to bounce from. For me this has resulted in an accelerated expansion of my visual skills as a recorder and enhanced my facilitation processes and also my confidence has soared. As a direct result of being part of MMM I have landed more graphic recording work, seen an increase in the number of referrals and repeat business for my practice and the personal 1-2-1 coaching I have received from Christina has significantly helped me hone and focus my business development and services offered. It is without doubt the most important investment in myself and my business development this year and I have already made back the investment price several times over through increased work I have received. 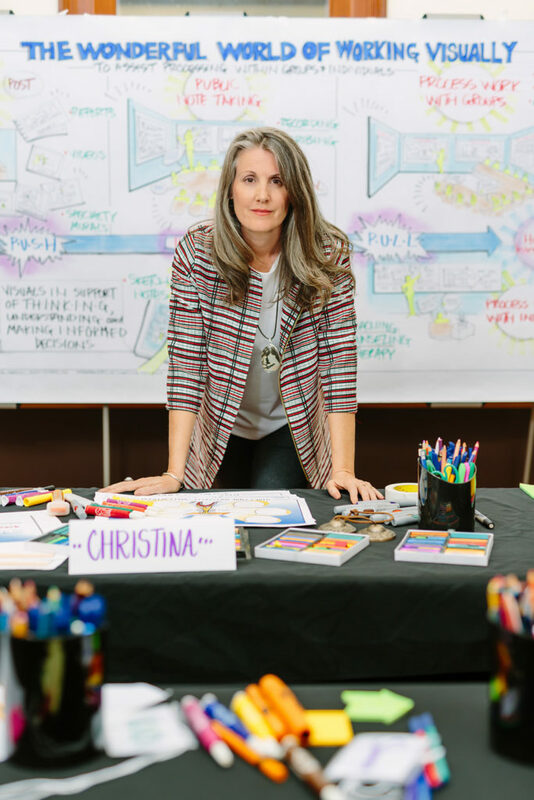 If you want to expand your visual skills, develop your visual business offerings and be mentored by an industry pioneer you can learn from no better mentor than Christina. 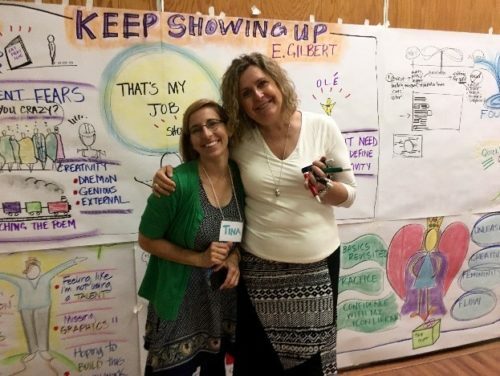 “I have had the privilege in taking a number of training programs with Christina, who has been a pioneer in moving forward visual recording, visual facilitation and visual coaching as professions in Canada and internationally. I learned a great deal through the Fundamentals of Working Visually, and later through the Magic Marker Mastermind. I grew and honed my visual skills with Christina’s support and coaching. I particularly enjoyed the camaraderie and friendships developed. Nothing beats the in-person MMM retreat where we shared ideas, drew madly in our graphic jams for difficult concepts, learned from each other and explored emerging tools and techniques. “A year after taking Christina’s Fundamentals of Working Visually I followed up with her Magic Marker Mastermind — to take my visual practice to the next level. The Visual Practitioners in this group were amazing! 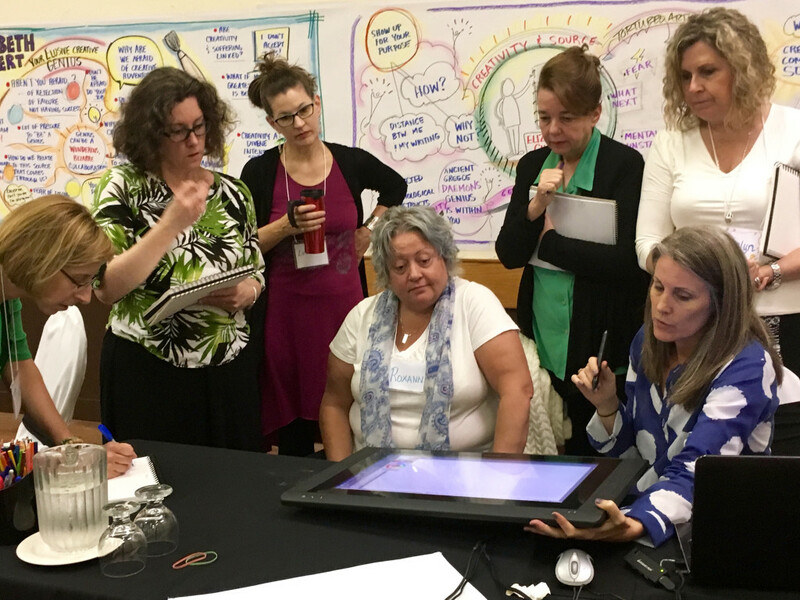 I loved the opportunity to connect with colleagues and learn about the many unique ways of working with visuals. Our private Ning Forum was a great way to share work, materials and get feedback.